The aim of the refit was to update all of Cambria’s mechanical, electrical, plumbing, hydraulic systems and a new engine. The new engine increased fuel efficiency and thus range, whilst reducing weight and noise. To gain extra power to help against strong head winds was also an aim; however this was to be achieved by introducing larger motors at the shaft ends and rebuilding the pumps at the engine. Whilst achieving this we also attempted to reduce ambient noise and temperature through the boat. 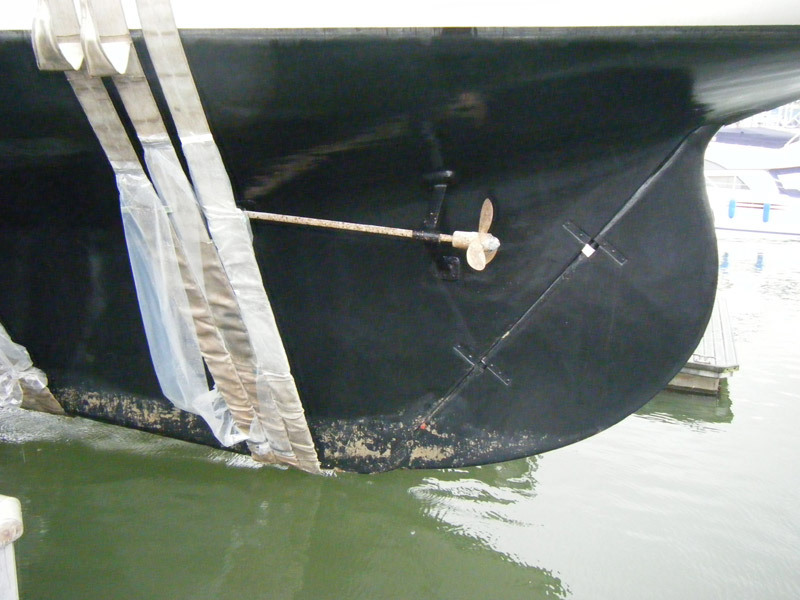 To meet these aims a large portion of the boats interior had to be removed. Since this had to happen it made an excellent opportunity to complete a thorough inspection of the internal structure of the hull frames, stringers, diagonals and planking. This has not been inspected fully since 1995. It also allowed us to make modifications to the saloon, to incorporate a navigation station and to remodel the aft cabin into a master cabin with full sized ensuite. 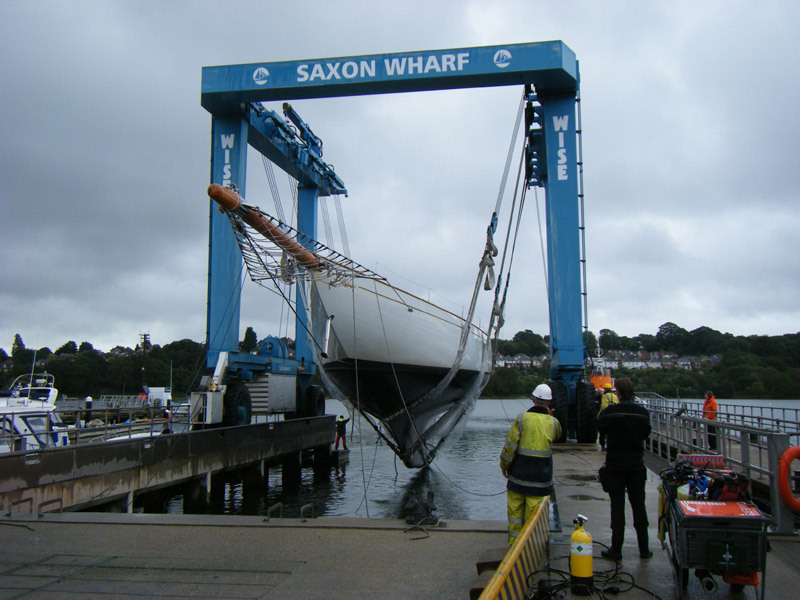 After talking with a number of yards in the winter of 2007, we chose to use Southampton Yacht Services and to commence in the autumn of 2008. SYS have a proven record with large wooden classics, Altair and Belle Adventure plus an excellent facility located up the Itchen River in Southampton. It was very important to have a yard that work with the crew, developing the team early would ensure a good working relationship for the duration of the refit and perhaps future projects. Cambria only competed in one Classic regatta that year as a result which was Antibes in June 2008. It was a successful regatta where Cambria showed her stern to all from start to finish, winning both on water and handicap against other big class yachts Lulworth and Moonbeam 4: An excellent result to celebrate her 80th year. Immediately following a summer cruise in Corsica, Cambria left Cannes on the 12th of August with a crew of 10; 3 watches of three plus the chef. Cambria carried jib, staysail and trysail for the delivery. We also had the cruising main should we have the opportunity. First a scheduled short stop in La Ciotat to pick up spruce supplies for minor mast repairs, before heading out across the Golf of Lion to Palma for the first fuel stop. This first afternoon/ evening proved one of the best sails of the delivery, a beautiful 20/25 knots on the quarter with 12 knots boat speed. A quick fuel stop in Palma, before heading on to Gibralta. Thick fog off Gib delayed entry until morning. Once refuelled Theo Rye joined us for the evening to put together some ideas for the aft Cabin and the nav station, making sure we stay as true as possible to Fife and maintain Cambria’s character. Once through the straights of Gibraltar we turned north and into the Portuguese trade winds. Northerly winds of 20 to 30 knots delayed the progress and led to yet another fuel stop in Cascais, Lisbon. We were weather bound for four days before enough of a lull to make our way north again. We rendezvoused with Mariquita off Cape Finisterre as they were heading south before heading into La Coruna to pick up two extra crew and fuel up before Biscay. A favourable, yet short, weather window meant letting go lines at midnight after fuelling. Light following winds gradually increased over the next three days, resulting in shortening jib then trysail, running just under staysail, still at 10 knots. With the steep following seas Cambria was awash constantly, clearly showing she was designed for inshore racing rather than ocean passaging. After an exciting night including burst fuel bladder and snapped flag staff, we arrived into the relative lea of Cornwall and into Falmouth. The wind was still strong but favourable so we continued on towards Southampton arriving there midday on the 4th of September. ina in front of SYS) is 200 ton and was excellent and though, due to car park complications, we could not move straight into the shed, the following morning Cambria floated through the air before landing and chocking in the shed. During this 1 week period all soft furnishings, furniture, books, paintings, galley equipment, stores, lazarette and fore peak gear, and crew belongings were all removed to the containers in the yard and the crew accommodation in Hamble. We had five containers at SYS: one workshop, one rigging/paint shop, two for storing all fixed furniture and panels removed during the interior removal and an office. Sails, standing rigging and tender were all stored on top of these containers inside the shed. September was a period of removal. The engine room: draining hydaulics, coolants, fuel. All wiring was disconnected and removed. Winch packs, pumps, generator, chargers, AC and DC boards, exhaust, oil cooler, oil reservoir, windlass hydraulic tank, water maker and stripping Carla (the old Cummins 330hp) ready for removal. 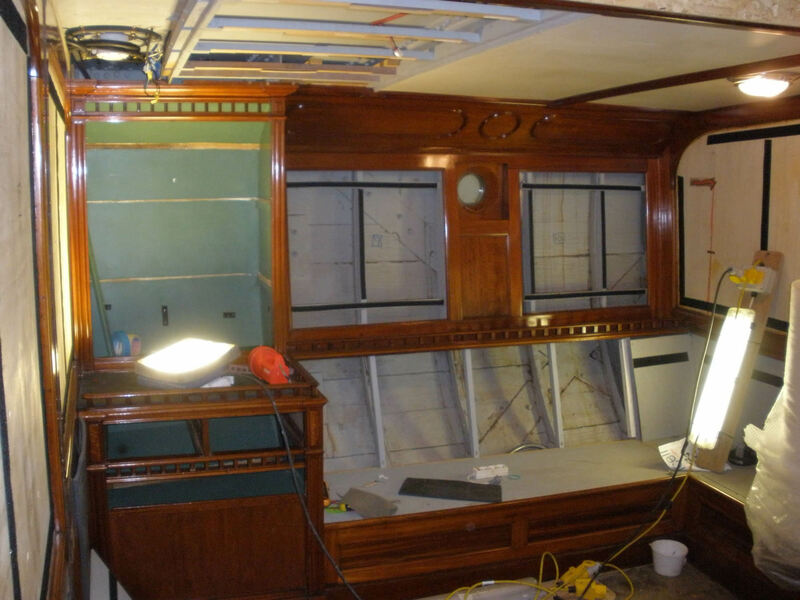 The Saloon had to be stripped with the original panels carefully removed and labelled, carpet out, cabinets, wine and drinks cupboards. The main saloon hatch removed and cowlings protected to allow for everything to pass in and out. Another soft hatch was cut into the engine room/saloon bulkhead. Carla came off her beds and out of Cambria on the 26th of September. It was a sad day after 22 years of service. During this period there was still much designing continuing. With all the tanks out and the main bilge stripped we had a much clearer idea of the space and how to organise the replacement equipment. Sys have a system called Catia, which takes 3 dimensional measurements and transfers them via computer software into an accurate drawing of the space .We would increase the bunker capacity to 2350ltr, up from 1750 ltr. We used to carry 600 ltr in the main day tank, 440 ltrs in two drums in the lazarette and a further 700 ltrs in a fuel bladder also in the lazarette. The tanks are made of 2mm S/S and though all are greater capacity than the old tank (mild steel 6mm) they are individually 30% lighter. We also removed the old water tank, again replacing with S/S and the grey/black water tank replacing it with a polyurethane ‘Tek Tank’. One of the design challenges was to ensure that the tanks were removable and not ‘built into’ the boat. Due to Cambria’s age it is important to be able to access all spaces and should the need arise be able to get to the hull. By the end of October the chipping, grinding, sanding and surface preparation made way for the first coats of red oxide and primer. By such time we had found a number of areas in the hull which needed extra attention. Areas of the bilge stringer by way of the old power board in the engine room had completely rusted away; we also found areas behind the old oil reservoir location of very soft wood, and parts of the diagonal strapping that had also wasted away. This lead to replacing sections of five planks and reinforcing the steel work. The hull planking removed varied with planks of mahogany, oregon and pitch pine. As Cambria is sheathed in glass this had to be removed to get to the repairs. The glass was still well bonded to the planking, particularly to the mahogany. The fibreglass thickness is approximately 3mm over the hull. At the same time we found more rotten wood port side around the shaft logs. This was predominately in the seam of two planks, pitch pine and Mahogany. It appeared as though the caulking had been ‘wicking’ moisture from within the planks, accumulating at the seams. December continued where November left off. Mock ups of the navigation area were progressing with Rob and Theo working to ensure the joinery was in keeping with the rest of Cambria and William Fife’s original work. Mock up tanks were put into place to check maximum volumes and clearances. As with everything else in this refit, they were designed to be brought in through the saloon sky light hatch, then into the bilge through a soft patch in the floor. Once into the bilge everything must be man handled into position. With this completed the mock-ups were sent off for the tanks to be built. The tanks were to be due back to be fitted in mid January. The port side shaft log and planks were also removed for the repairs to be carried out. The cockpit received some attention at this stage. The old hatch to enter the workshop/lazarette/nav station was decked over to make way for the new master cabin ensuite. To access the lazarette we needed to put in a new hatch. This was added on the port side of the cockpit. With this work happening we also used the time to make repairs to other areas in need by way of the cockpit coaming and the deck. With the Nav station mock up complete, Rob moved aft to ‘rod’(draw full scale) the owner’s cabin. There had been much discussion about this area. Firstly to provide what the owner required and secondly to remain true to the Fife design. Ideas and adaptations bounced between relevant parties before eventually we could make it work. ( in January I was given a copy of the original General Arrangement of Cambria which none of us had ever seen, and to our surprise the layout we had agreed upon, returned Cambria to her original aft cabin configuration!). Following the Christmas break, January was to become a crucial month in terms of schedules. Cambria needed to be in the Eastern Med by the middle of June. Up until now progress had been slow with a number of factors conspiring against the program. January needed to be a positive month forward. The electricians were laying the cable trays and starting to run cables, but we still needed to get the new engine in to see physically how everything would fit. There always seems more space on a drawing than in reality! On the 23rd of Jan the new engine went in for an initial fitting. The new tanks arrived and looked fantastic, however they did not fit as required so had to go off to be modified. This has a massive snow ball effect as nothing can be fitted in the bilge until the tanks are fitted. More positively the crew had moved forward with their work list and the forepeak remodelling was complete and the lazarette rebuild was underway. With the new aft cabin layout the bulkhead between the lazarette was moved two frame bays further aft. This then meant the laz workbench needed to be re-built and the old Nav station was reworked to become an office. With the exception of the Hamman treatment plant and the shore power transformers, the rest of the laz area is dedicated storage. The cockpit was moving ahead. The crew only had February to finish their work list. March would be consumed by preparing and painting the topsides; we were hoping to go into the water in April. By the start of February, with the delay of the tanks it was obvious that it was going to be a struggle to get into the water by April. It was now that the team at SYS stepped up. Theo joined the team as an objective project manager. We had additional staff join the project by way of another engineer, electrician and joiner. Another shipwright also assisted with the shaft planking. By the end of February, the planking was finished, the amended tanks were fitted, the motor drive reinforcement structure was in place. The aft cabin fit out had commenced and the scaffold was up for topside painting to start in March. March was a productive period. The crew went full time on the topsides. The yard went into shift work around the clock. By this stage, with everything going back into Cambria, we had to go into shifts because of the nature of the work, people would be in each other’s way. The engine room was now fully insulated for noise and fire with Alcobond. The AC and DC control boards were in place, and the dewatering exhaust silencer had arrived. With the generators in place the major engine room items were accounted for. It was difficult for the engineers, electricians and fitters to work in the same space, hence the shifts. Painting the topsides is always a challenge. The end result is only as good as the preparation that went into it. This was the crews challenge and it had been 4 years since the last paint job. Everyone got stuck in and after the first week the topsides were sanded with 220 grit, spot filled, faired and primed. Over the next weekend a complete coat of Awl Grip 545 was applied. We left Sunday for drying time and started again Monday with the sanders, this time with 320 grit. By Wednesday we were able to apply the 1st topcoat. After 2 days drying we sanded again down to 400 grit. On the following Monday we applied the final topcoat. The end result was fantastic and with the gold leaf applied, Cambria again looked stunning. On board with the tanks in place and the main engine bolted in, Hercules Marine could install the hydraulic pipe work. This was a mix of solid and flexible hoses, with the aim in reducing pipe noise and vibration. The shaft motors were fitted and connected. The main heavy machinery was now in place. The date for Cambria to go back into the water was set for the 25th of April. 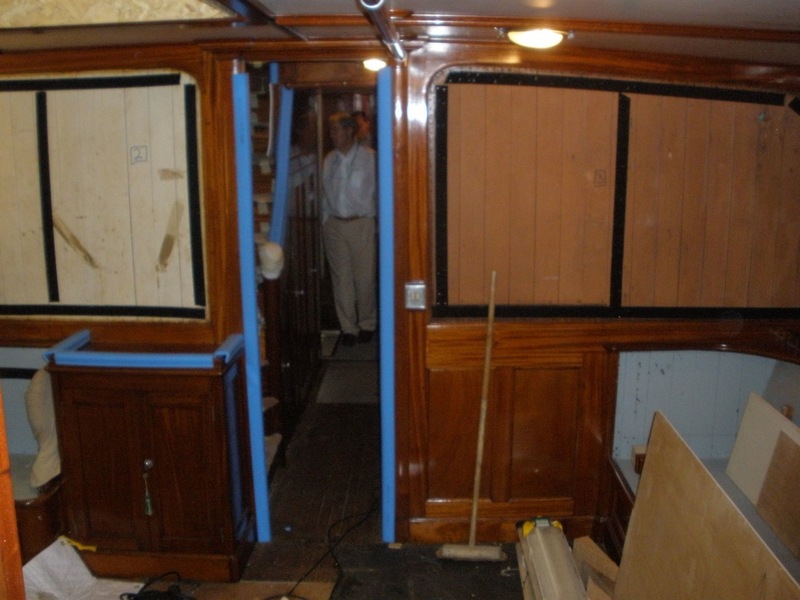 The joinery was moving quickly and the soft hatch between the engine room and saloon was reinstated. This then allowed for the generator exhausts to be connected and also allowed the saloon to be put back together. 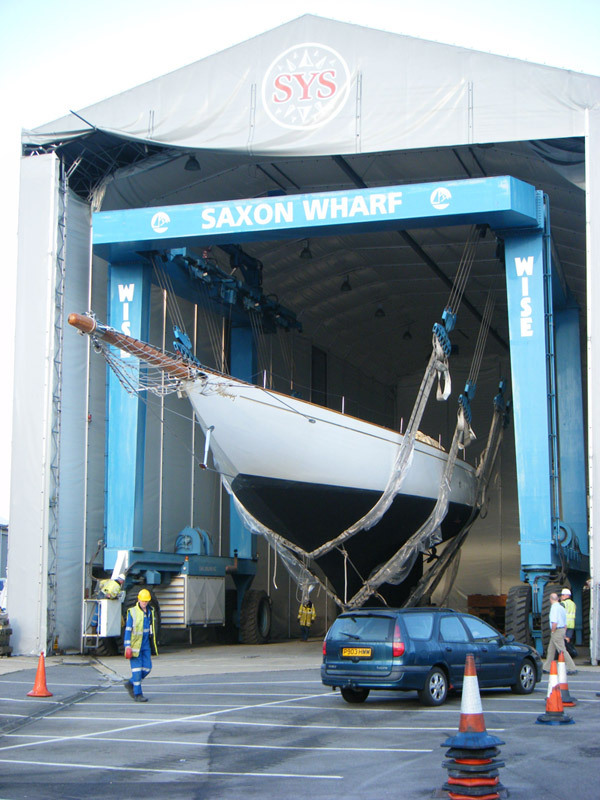 To put Cambria in the water, the mast had to be removed from the shed to allow the travel lift in. 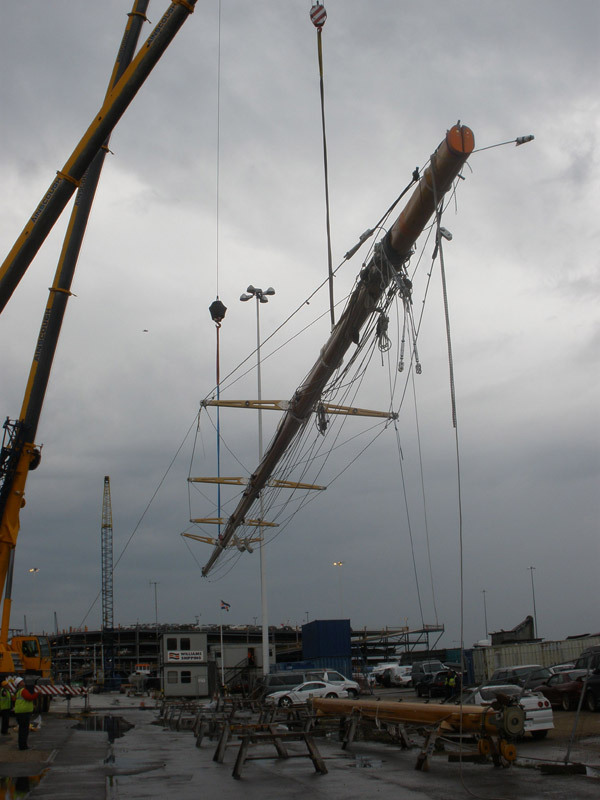 The mast had been oiled and a few minor repairs completed. It was then barged down to Empress Dock to be rigged ready to be re stepped. Between the 25th of April and the 20th of May a myriad of work was completed. The layout of the equipment worked. There is plenty of space to access the systems and everything followed a logical progression. The sea trials went well with the desired speeds, exhaust temperatures and oil pressures achieved. By the time the delivery crew arrived we were ready to go, waiting for favourable weather. The only issue we had was with the Hamman treatment plant. We later located the problem to a design fault which has now been modified. Writing this report now 18mths after the completion of the refit I can say it was a complete success. The goals we set out to achieve with SYS have been met. Cambria has since completed 10000 Nm cruising and racing and we are looking forward to many more. A special thanks to the crew: Dave Hambly(Mate), Sean Kippers(Bosun), Natasha Whiteford(Chef), Matt Haskell(Engineer), Rebecca Goff(Stewardess) and the extra help in the final stages from returning engineer, Andrew Carter. To the SYS team including Ray, Peter I, Barry, Rob, Dave F, Dave, John, Adam, Paul, Mike, plus all the other Joiners and fitters that helped in the last minute push. Thanks to Piers and Harvey for joining in with the Cambria spirit. Thanks to Theo Rye for his help, support and knowledge throughout.